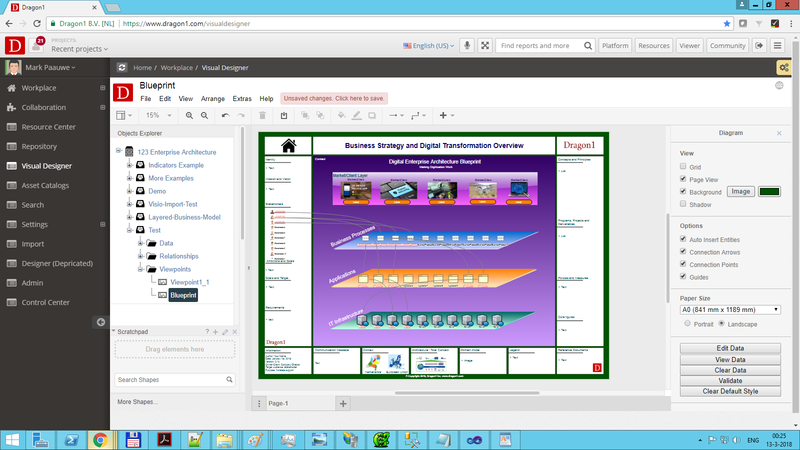 Create animated Enterprise Architecture Framework diagrams yourself starting with a Trial Account here. Take a peek at the tutorials in the Dragon1 Step-by-Step Guide. Why do you need to create Enterprise Architecture Frameworks? As Enterprise Architect one of your primary tasks (or should be) is creating AS-IS and TO-BE Enterprise Architecture Frameworks for several types of architectures. You line up these architectures part of the enterprise architecture that are defined and present, and also the ones that are not defined and not present in the organization. Why should you start creating an Enterprise Architecture Framework? What steps do you need to take to create one & what should the result look like? The possible answers to these questions are presented in this enterprise architect tutorial. 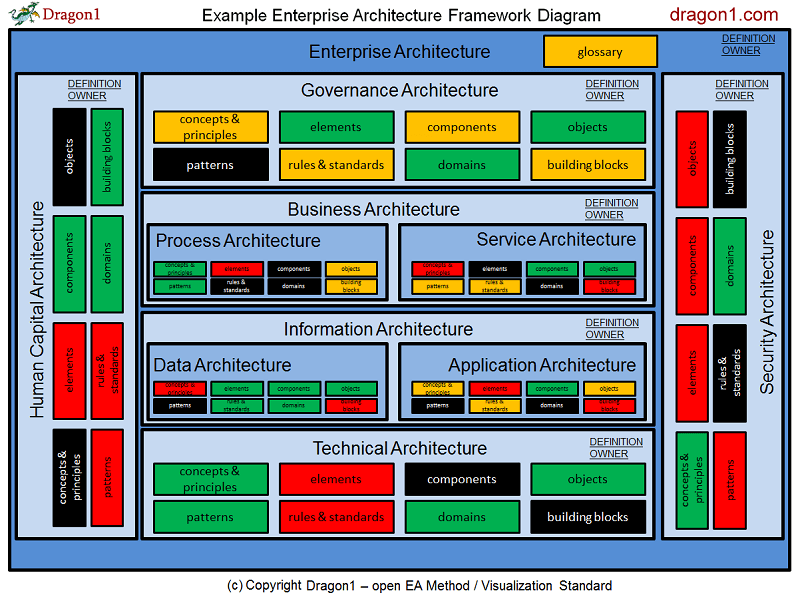 Two Dragon1 web applications were used to create this interactive and dynamic visualization of the EA Framework: the Architecture Repository and the Visual Designer. 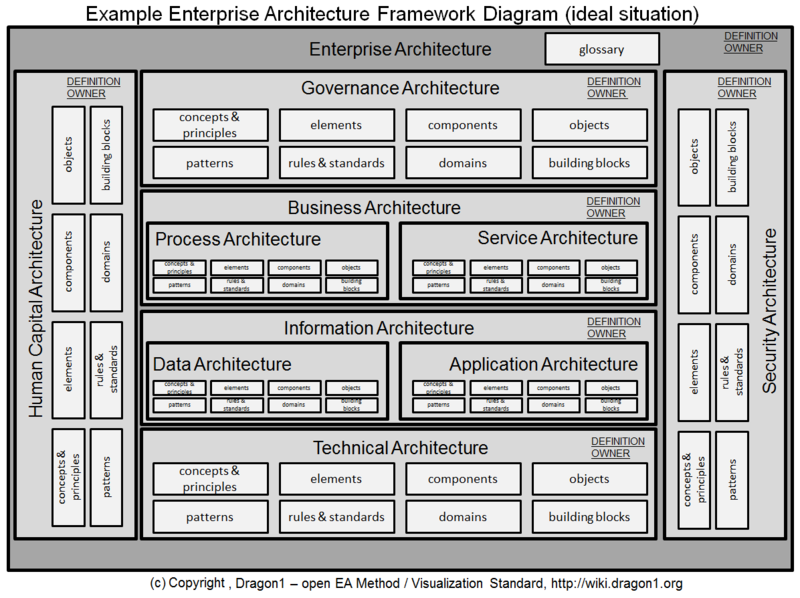 What is an Enterprise Architecture Framework exactly? An Enterprise Architecture Framework in its smallest form is nothing more than a classification scheme of types of architectures and their most important parts in a single schematic overview. An Enterprise Architecture Framework often can be visualized in a reasonably small but still comprehensive diagram. You need to create a separate diagram per architecture plateau (AS-IS, Plateau n, TO-BE, Envision). TO-BE or AS-IS, that's the question! The TO-BE version of an Enterprise Architecture Framework is more complex to create than the AS-IS version since it requires new visions, missions and strategic decisions. The AS-IS is of impact today, even if you did not create the enterprise architecture framework yet. Therefore it is always useful to visualize the AS-IS framework and reuse the current (old) strategy aspects to create the diagram. Having the TO-BE and AS-IS architecture diagrams available is extremely helpful to support high-level overview and decision support. It is just sitting there, waiting for you to dust it off! Enterprise Architecture Frameworks show the types of architectures used at a certain moment in time and it shows the concepts, principles, standards (norms), building blocks, metamodels and user models that are part of the underlying architectures. You, as an enterprise architect, can decide yourself which parts of the architectures you think should be part of the framework. An Enterprise Architecture Framework diagram is a special type of Enterprise Architecture Diagram. A diagram is only an architecture diagram when it contains information about concepts that together create an architecture or are part of an architecture. An architecture diagram is a conceptual structure diagram. If a diagram omits the conceptual layer and only show elements of the logical layer it is not considered anymore an architecture diagram but a logical structure diagram. If a diagram only shows the components and objects of the physical layer the diagram is considered to be a physical structure diagram. Often the conceptual, logical and physical layers in diagrams are mixed up. Dragon1 advises always to focus on a layer in a diagram or at least to complete one layer in one diagram (the diagram shows the complete logical layer, etc..). Show an example EAF diagram to the owner/client (the CIO). Get the assignment to create an EAF diagram and make sure it is clear who is going to approve the EAF diagram and who is going to use the EAF diagram for what purpose. Make a list of candidate architectures and describe the enterprise architecture function: the architectures people talk about and that are common in your organization. Look at the structures, systems, domains and functions which are present in your organization. Are there already architectures defined for them? Check if there is an architecture for a structure, system or domain, check if there are concepts and principles applied and if there are policies, rules, standards applied for that structure, system or domain. Try to find a reference model for the framework that is common for your industry. 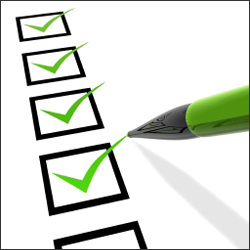 Review your list with others to verify the actual status of the architectures. Try to get a common definition for the architecture (to define its content, context, scope), who is the owner, who is the manager and who is the user? List 7 issues for the architecture. List 7 products of each architecture to create or have. With these products, the owner and enterprise architect of an architecture can direct developments and realizations. Select the entities for your architecture framework model from your company's enterprise meta-model of architecture modeling language. 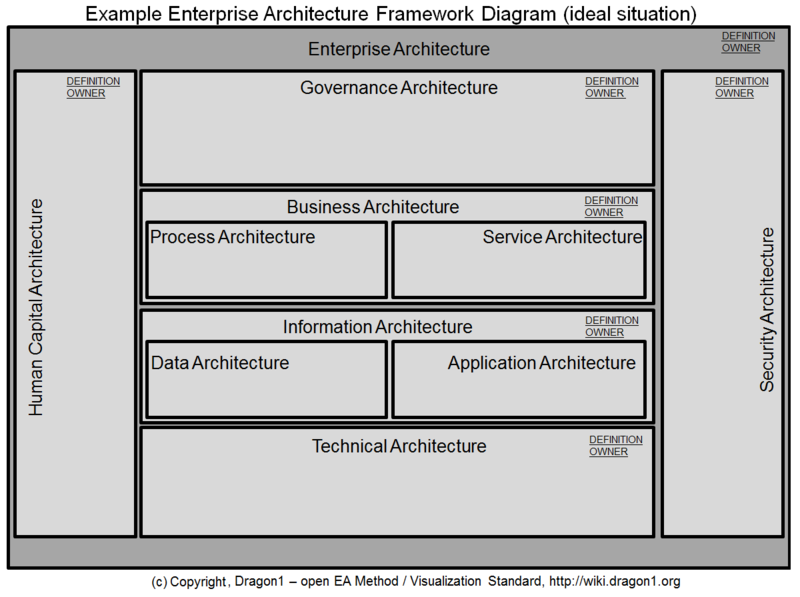 Create the enterprise architecture framework model. Create a management overview of the Enterprise Architecture Framework model. Be sure you are not visualizing the perfect world (figure 1), but the current actual situation (figure 2). It could well be that your organization holds two different business architectures and technical architectures. That all depends of course of your definition of architecture. 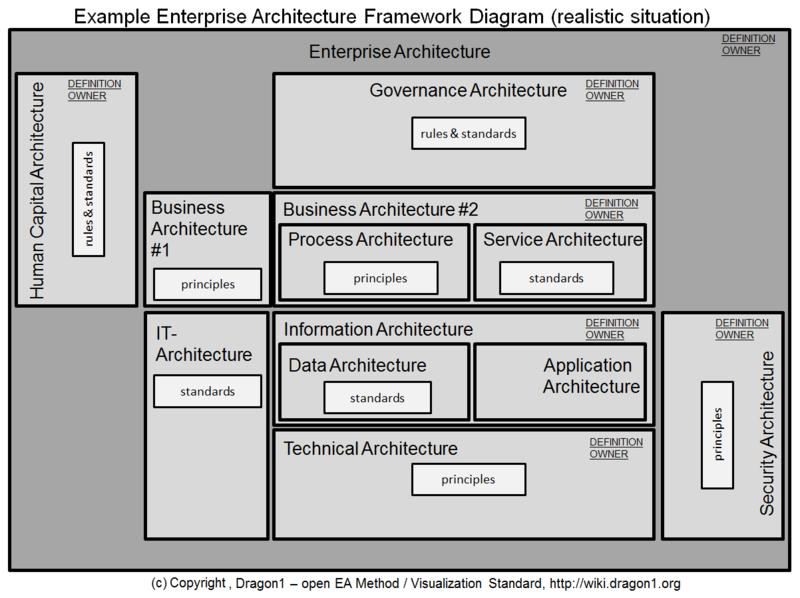 Visualize in a diagram the management overview of the Enterprise Architecture Framework model. Write down in a document why, when and how you created the diagram and how it should be maintained. Present it to the owner/client and have the EAF diagram approved and used. Make the diagram part of the maintenance update cycle for architecture products. When to use this Enterprise Architecture Framework? 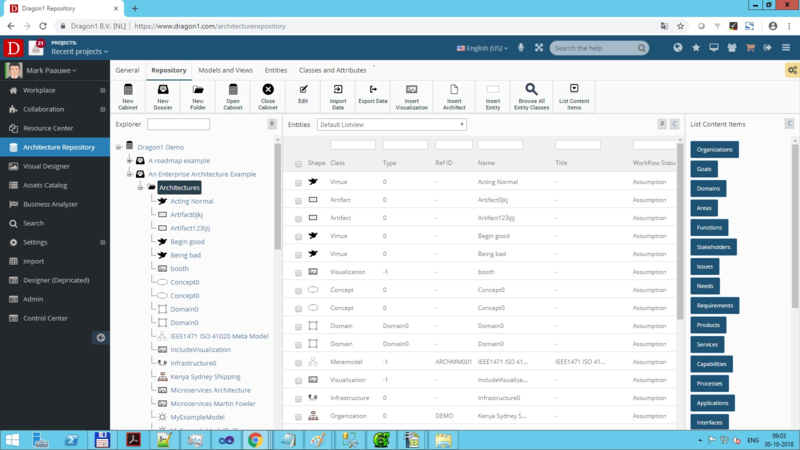 On Dragon1 it is important for you as enterprise architect to get the assignment to create a product, such as an AS-IS Enterprise Architecture Framework. To get that assignment from the owner/client (CIO preferably), you will need an example EAF diagram. That example you could create without an assignment and you can prepare a case or situation to depict so you can really show the benefits of having such an EAF diagram available (when does it come in handy). What are questions people now have, what are issues and problems regarding consisting architectures and how does this diagram help to solve them? With an Enterprise Architecture Framework you can do a lot of reporting, such as using colors how well the architectures are designed and implemented yet, or how well they comply to certain standards. If created correctly it can act perfectly as auditing framework. Suppose you could use the color red to say a part of the architecture in the current situation is not implemented and not compliant to the company's strategy and policies. The color orange you can use for the parts which are partially compliant and the color green that it is fully compliant. And black means you could not get the status and white means getting it status has not been done or planned. A typical management report view of the enterprise architecture framework like this will often cause that an owner/client (CIO) takes immediate action. We hope we have inspired you to start creating enterprise architecture frameworks. If you do not have the time and you need an Enterprise Architecture Framework on short notice, we can create a Framework for you.